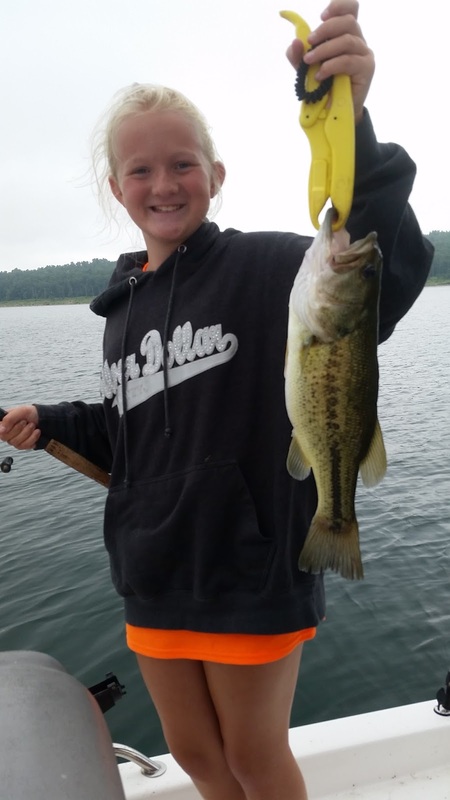 Norfork Lake fishing continues in its hot summer fishing pattern. Most fish are deep and will continue to go deeper as the thermocline drops. To be quite honest, not much has changed since my report last week. I am catching stripers before sunrise in 35 - 45 feet of water on long points and large flats. As the sun comes up they move off the side of the point into deeper water 70 + feet, but are still 30 - 45 feet down. Live bait, vertical jigging with a spoon and trolling swim baits are all working. 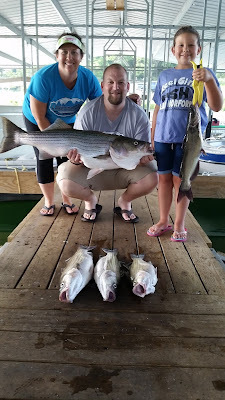 Over the past week I have been fishing with my family and we have been having a lot of fun. Some big fish are biting. 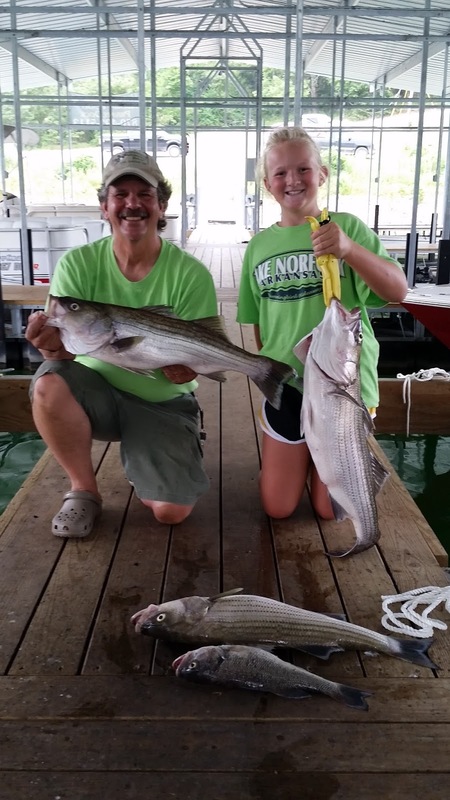 My 9 year old granddaughter landed a 20+ pound striper and my 12 year old granddaughter has caught several fish. 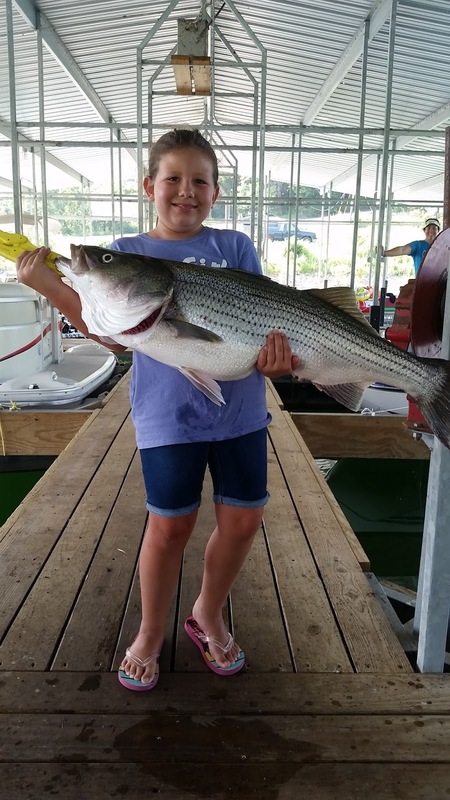 Her biggest so far has been a 14 pound striper. It is a blast to watch these kids fight a striper on their own from start to finish. We're making some good memories. The biggest change this week over last is for the largemouth and spotted bass. I, as well as a couple of my guests, have found some good top water fishing in the morning at sunrise and also at sunset. 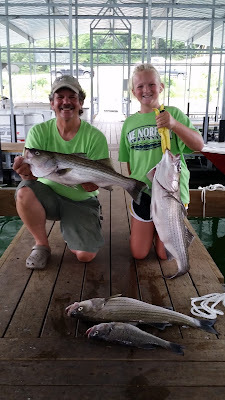 The other day I was fishing with my granddaughter and we were sitting in 70 feet of water off of a point where she was catching stripers. In the times between netting her fish, I was casting a Kastmaster into 25 feet of water. Almost every cast after the bait hit the water a bass hammered it. Some were keeper size, most were small, but still a lot of fun. The other location where my guests have gotten into top water fish is back in the major creeks in shallow water. Fish are chasing shad early, but even after you don't see them they are still coming up for a top water lure. Wiggle warts are also working very well most days. Crappie fishing is in its normal hot water slow time, but there are some good crappie being caught.They are still under docks and you can also find them scattered along the deep water bluffs. Locate a ledge 20 - 30 feet down and they will be suspended along the ledge. Small swim baits as well as live minnows have caught some nice fish. Norfork Lake water level is holding stable with minimal power generation and currently sits at 552.63. The surface water temperature is ranging from 87 - 92 degrees depending on the time of day. The main lake is clear and some creeks and coves are stained with others clearing. 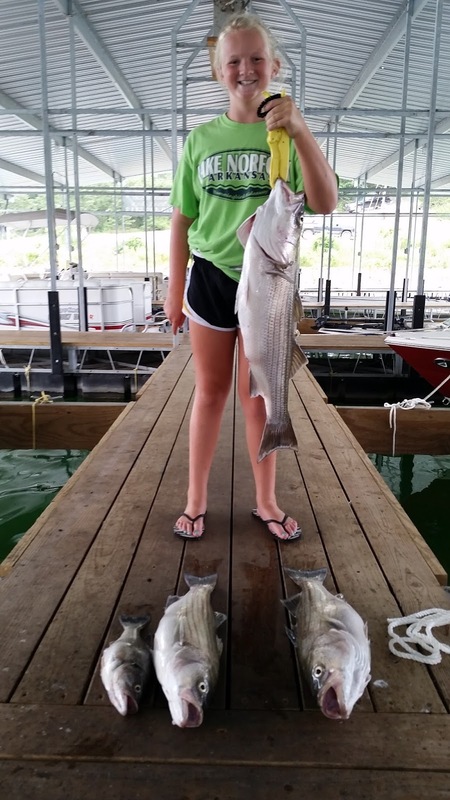 The lake is in great shape for all your summertime fun activities, not only fishing.